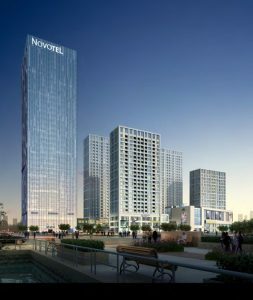 Ningbo, China, March 29, 2016 /ChinaNewswire.com/ - AccorHotels announces the opening of Novotel Ningbo East. Located in the Ningbo Eastern New Town of the sub provincial city, the hotel is the first Novotel property to debut in Zhejiang Province. Located in the Ningbo Eastern New Town, the new build hotel is a 2 minute walk from the city’s Metro Line 1 station, 20 minutes’ drive from the Ningbo Train Station and 30 minutes to Ningbo Lishe International Airport. Ningbo Culture Plaza, Ningbo International Financial Center and Ningbo International Convention and Exhibition Centre, among others, are all located within close proximity to the hotel, making it an ideal place to stay for both business and leisure travellers. Featuring 258 modern and spacious rooms with the brand’s exclusive eco-designed Live N Dream bedding concept that provides a good night’s rest and a pillow menu, coffee machine, iphone docking stations and in-room amenities, the hotel offers travellers an ideal choice for family and business travels. The distinctive Novotel brand colours of blue are seen across the hotel’s interior decorations and glass panels. It also symbolizes the vitality of the Ningbo Eastern New Town giving the hotel a distinctive touch. The hotel also offers creative and well-balanced dining options to cater to the various guest palates. The Square, all day dining restaurant serves an authentic Asian inspired buffet and a selection of international cuisines. The Lobby Lounge is the ideal place to spend a relaxing afternoon over a coffee and cakes or evening drinks and snacks. For MICE and events, the hotel’s state-of-the-art function rooms provide corporate travellers a selection of choice offerings of its event space. Fitness facilities include a gym with yoga and chess rooms for a morning or evening work out revitalise the body and soul. Personalized services at Novotel Ningbo East also include a Web Corner in the hotel lobby and kid-friendly offerings.